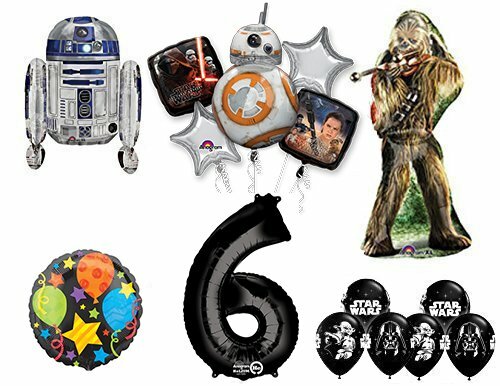 With this Ultimate Star Wars 6th Birthday kit you will receive: (1) 38″ Chewbacca Shape Foil Balloon, (1) 26″ R2-D2 Shape Foil Balloon, (1) 33″ BB8 Shape Foil Balloon, (2) 18″ Star Wars The Force Awakens Square Foil Balloons, (1) 34″ Black Giant Black Number 6 Shape Foil Balloon, (1) 18 inch Balloon Jubilee Round Foil Balloon, (2) 19″ Silver Star Shape Foil Balloons, 6) 11″ Black Star Wars Print Latex Balloons. All balloons ship flat. Just add Helium and ENJOY!